We get that our intelligence agencies must collect and investigate information on terrorists or suspected terrorists. We get that modern technology and communications provide immense capability to track down these “evil doers,” as President Bush used to call them. We also understand that there are a whole host of complex and secret relationships with foreign governments, foreign agents, foreign communications companies that come into play here – in addition to U.S. relationships. This is one big intelligence universe. But, in my work with the Senate investigation of the National Security Agency back in the mid-1970s we discovered a very disturbing connection between the intelligence community and American communications companies. This was a wholesale “metadata” program as it might now be called. Every day all the telegrams would be sent to NSA headquarters. The legality was never fully established. The companies were initially somewhat uneasy about turning over all this information. But the program just kept rolling along, codenamed Operation Shamrock, until our investigation for the Church Committee. We now forget the problems this caused: no warrants, no oversight of how mail and telegrams were handled, no reporting requirements, no serious legal analysis of the program. This was the “vacuum cleaner” approach to intelligence collection. Get everything. And the corporations and communications companies were complicit. Surely, they all felt they were battling communism, rooting out spies, contributing to the Cold War efforts. This was done out of patriotism not some nefarious plot to undermine American’s civil liberties. Yet, once Richard Nixon and his team put in place a list of Americans whom they considered subversive – Jane Fonda, Bobby Seale, Tom Hayden and a full collection of anti-Vietnam activists and civil rights leaders – things went south fast. This was a secret “watch list” of Americans, who they considered dangerous. The line was crossed. And the companies did not know how their data was being used. Now fast-forward 50 years and we have a similar series of relationships with our phone companies, possibly our Internet and search engine companies. We have a Patriot Act and revised Foreign Intelligence Surveillance Act open to serious interpretation. And we have a technology that collects and stores billions of these interactions a day as opposed to 150,000 telegrams a month during the last century. We know our Facebook messages are up there for all to see; we know that our Internet searches are stored; our phone calls are archived; our tweets are fair game; our photos are taken on busy street corners; our credit cards are easy pickings; our whereabouts are tracked on our cell phones or in many of our cars. In short, our personal space isn’t so personal. Well, I don’t buy it. 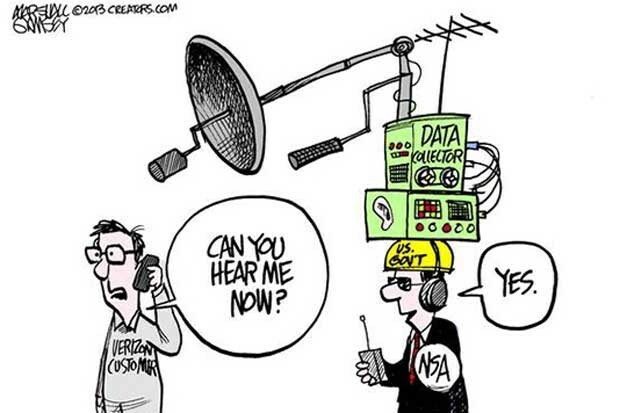 Technology has its price but part of it cannot be that the government has the right to coerce or demand that private companies, who control all this data, hand it over wholesale to NSA. It was not right for Western Union and the other companies in the 1950s; it is not right now when technology is so mind-boggling, so invasive and so ubiquitous. Congress and President Obama have to take a good hard look at the laws, at the Fourth Amendment against unreasonable searches and seizures, at what the collection, storage and analysis of information on Americans does to our civil liberties. Secrecy is an aphrodisiac to those in power and so is the collection of information. The cooperation between our government and private data and communications companies like Verizon, AT&T, Facebook and Google, is a very dangerous slippery slope. It has been greased by the Patriot Act and we are sliding faster and faster down it to devastating effect. It is past time for Congress and President Obama to recalibrate and retreat from invading the privacy of our people.